First posted at Steemit.com here. First Aid Emergency Remedies whilst awaiting an ambulance. I’ve been asked by my private Facebook patient support group to provide a list of “On the way to the hospital” first aid emergency remedies. In a first aid emergency, you should expect yourself, the patient and often bystanders to suffer from some form of shock. Aconite 10M can be useful to everyone involved, stop people panicking and prevent the development of physical shock. Shock can be dangerous for the patient and can have long-term effects for all involved. The purpose of this is to cover all bases. 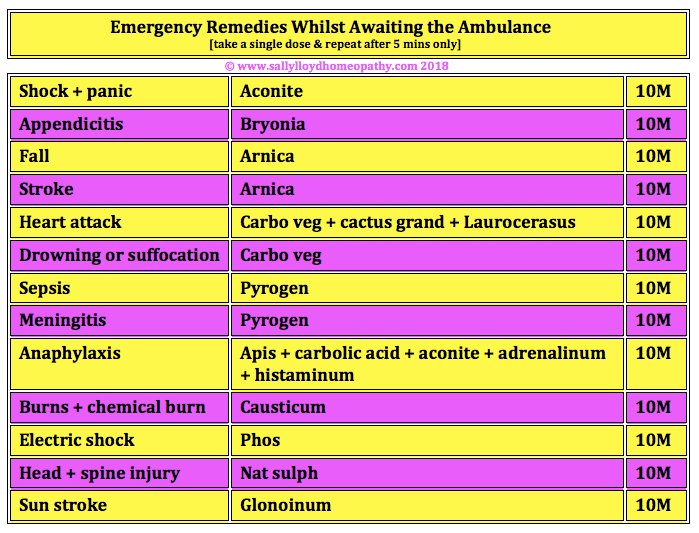 You don’t have time to work out which remedy is most suited in a heart attack or anaphylaxis [the two combinations listed in the chart], so you’d give all the remedies listed in the combination at once when you are faced with a serious first aid emergency. The homeopathic pharmacies I most often use are here. Previous PostPrevious Homeopathic Metal Detox for GREAT RESULTS in Autism.